How to make text bold, italics, or attach links or images. In various locations in the Lookback dashboard, you can format text according to your needs. You can, for instance, make it bold, italic, underlined, or create headings and hyperlinks. You can even refer to images! We use a thing called Markdown in order to format the text. You'll write it in plain text, but the end result is formatted. You can read more about Markdown in this guide. Your notes and chats in the Live and regular player. The Intro and outro messages for a project. Make text bold by surrounding it with two stars: **bold text** . Make text italic by surrounding it with one star: *italic text* . Insert headings by using # , for appropriate heading level. # for first level heading, ## for second level heading, and so on. Hi Stephanie! 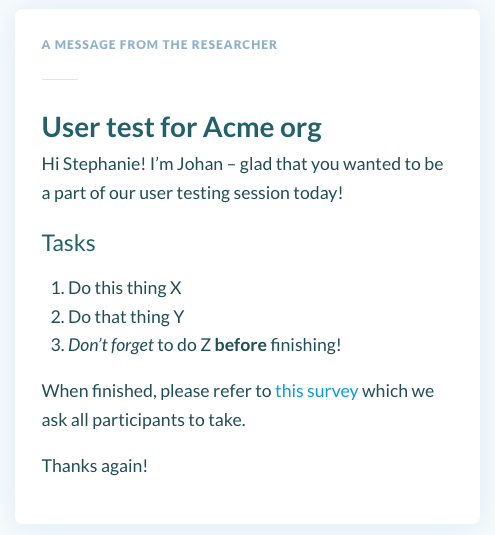 I'm Johan – glad that you wanted to be a part of our user testing session today! 3. *Don't forget* to do Z **before** finishing! When finished, please refer to [this survey](https://examplesurveylink.lookback.io/) which we ask all participants to take. Now you know a little bit more about how to make your text in Lookback look dashingly good!